News of the transition of the President of the Bakweri Land Claims Committee (BLCC), HRH Chief Peter Moky Efange early on Tuesday morning August 29th 2006 at the Buea General Hospital, caught the BLCC family and many Cameroonians off-guard, although it was well known that over the past two years or so, His Royal Highness had not been enjoying robust health. 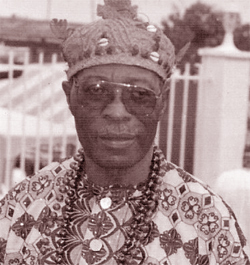 Chief Efange was among the early graduates from University College, Ibadan, where he read History, who joined the Nigerian Public Service with contemporaries such as Eric Dikoko Quan, also of blessed memory. He first worked in Lagos, Nigeria, as Assistant Secretary, and was later posted to Cameroon where he rose to the rank of Permanent Secretary in the Southern Cameroons civil service before joining the United Nations Organization, where he served in Ethiopia and Malawi from where he retired to his palace in Soppo Wonganga, Buea. A brilliant man by any standard, he had a commanding mastery of the English language as many of his writings attest. Fearless and nationalistic, he served his people admirably in various capacities and was of a very generous disposition to those around him who needed help. Most of all, he would be remembered as having ascended to the Presidency of the Bakweri Land Claims Committee, subsequent to the death of Chief Philip Mofeme Ewusi who had succeeded the founding President Chief G. Mbella Endeley. It was during Chief Efange’s presidency of the BLCC that he pulled the trigger for the commencement of the legal encounter in Banjul against the Government of the Republic of Cameroon, for abuse of indigenous Bakweri human rights concerning their ancestral lands currently occupied by the Cameroon Development Corporation. At a time when he was feeling poorly, and could not travel to head the delegations to Banjul, he made the extraordinary sacrifice of sending his wife and only support at his side, Princess Joffie, to join the BLCC delegation as representative of Bakweri Women’s interests in the struggle. By the vicissitudes of fate, his last public act was the presiding over of the ceremony in his palace grounds a few months ago, when the verdict on the Bakweri complaint before the African Commission on Human & Peoples’ Rights was made public, to the satisfaction and jubilation of the entire Bakweri. Chief Efange’s wise counsel will be sorely missed, when the negotiations as approved by the Summit of the African Union between the Bakweri and the Republic of Cameroon, commence. Being a traditional Bakweri Chief, in his lifetime of three score and eleven years, His Royal Highness married several wives, and so leaves behind princes and princesses who live in several parts of the world, a host of friends and well-wishers, and the whole of the Bakweri nation to mourn his untimely transition. Kilburn, N.W. 6, in the City of London, England. Chief Efange, President of the BLCC, is dead, but the battle for the restoration of Bakweri rights over their ancestral lands, lives on. Chief Efange now sits proudly beside Chief Kuva Likenye who first engaged imperial forces in mortal combat in defence of Bakweri patrimony. Chief Efange employed the mighty pen as his fighting hardware to bring the land struggle to its present exalted state. May God Almighty have mercy on Chief Efange’s soul, and also bless the BLCC cause, for which the noble Chief was Commander-in-Chief. Place of Birth: Soppo Wonganga, Buea. Senior Administrative Officer/Permanent Secretary, West Cameroon government. 1962 - 1974. USAID Local Government Training Adviser to the Malawi government 1990 - 1992. President, Bakweri Land Claims Committee 2000-Present. Consultant to Cameroon government on Decentralization Project.